Charming, fascinating birds – or noisy and disruptive? Guinea fowl often generate mixed emotions, but apart from die-hard enthusiasts, anyone who has lived in close proximity to a bunch of guineas may well go with the second opinion. There’s no denying that guinea fowl are relatively easy to keep, providing you have plenty of space and no near neighbours. They are independent birds, self-sufficient foragers who will find much of their own food. Throughout the spring and summer they are productive layers – if you can find their eggs. 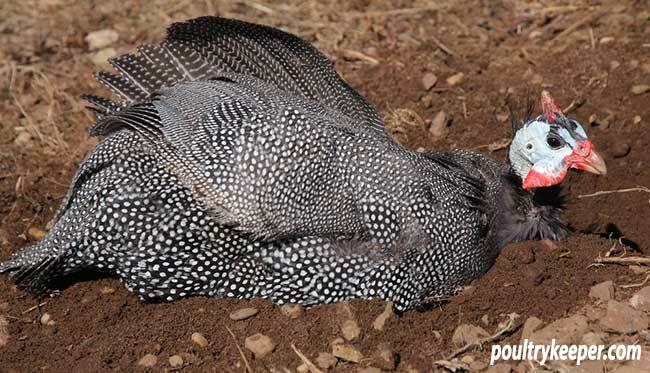 Guinea fowl will lay anywhere and everywhere, particularly favouring large clumps of nettles. The eggs are deeply flavoured, with large golden yolks and surprisingly tough shells. They are smaller than standard chicken eggs – more like bantam size – but their richness makes up for this. Guinea fowl are often kept for their meat, which is regarded as a delicacy. They taste slightly gamey, although milder than pheasant, and a full-grown guinea fowl should just about feed four people. There is a tendency to dryness, so pheasant recipes are a better bet than those designed for chicken. Even the feathers are useful – they can be sold for making fishing flies or for craft/millinery work. It’s a mistake to treat guinea fowl like chickens, although they share many characteristics. While chickens are much more inclined to domesticity, and can become very tame, guinea fowl tend to be wilder and more flighty. If regularly handled from day-olds they may be reasonably friendly towards their owner, but as a rule they hate being picked up or even touched. Guineas don’t automatically go into a house to roost either, much preferring to fly to the tops of the tallest trees, which can lead to many losses due to predation. Guinea fowl originate from Africa. They still exist in the wild, but for hundreds of years they have been kept domestically in many countries throughout the world. 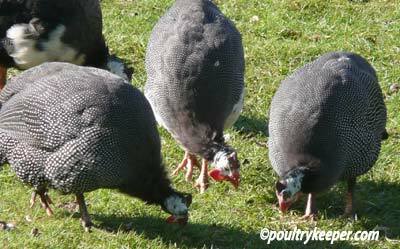 There are a few rather exotic types, but the ‘helmeted’ guinea fowl are the kind usually kept. 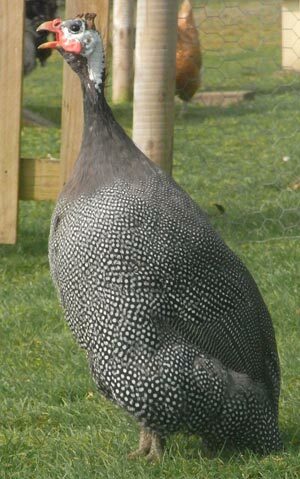 There are over 20 recognised guinea fowl colours, although the most commonly known is the original ‘pearl grey’ – dark grey with white spots all over. Given the chance guinea fowl will live happily in the trees, but you are likely to keep them longer if they can be persuaded to live in a secure house. Not only are tree-dwelling birds at the mercy of any flying or climbing night-time predators, but they will also descend at first light in time to meet returning nocturnal hunters on the ground. 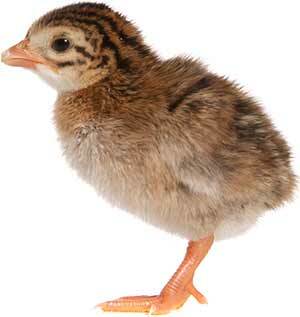 If the guinea fowl are obtained as youngsters (keets), it should be possible to get them used to living in a house. A shed or outbuilding can be easily adapted for their use, and is likely to be more successful than a standard chicken coop. Allow more space than for chickens and extra room on the perches too – the higher the perches they better they will like it. Either provide two pop-holes or make their doorway large enough to prevent bullies from keeping out the lower ranking birds. Unlike chickens, the shyer guineas won’t wait their turn to get into the house, but will simply fly upwards. Once a few have tasted the delights of outdoor life, the rest are likely to follow and the battle will be lost. Guinea fowl dislike going into dark places, so sticking a battery-powered cupboard light in their house will also be helpful. Nest-boxes aren’t necessary, as they won’t be used – guinea fowl like making their own secret nests. An alternative is to keep the birds in a large run, so that they have no choice but to live in safety. Give them as much space as possible, but roof the run or they will fly out (unless you clip their wings). It is said that fertility drops when guineas are kept confined, so they are probably much happier if allowed free-range. Choose either young keets or hatching eggs as older birds are difficult to settle in a new environment and are likely to remain rather wild. Guinea fowl eggs take 26-28 days to hatch and can be incubated in the same way as hens’ eggs. Bear in mind that the shells are particularly strong, although healthy keets should hatch without difficulty. Keets can be brooded under a heat lamp like chicks or naturally with a broody chicken. 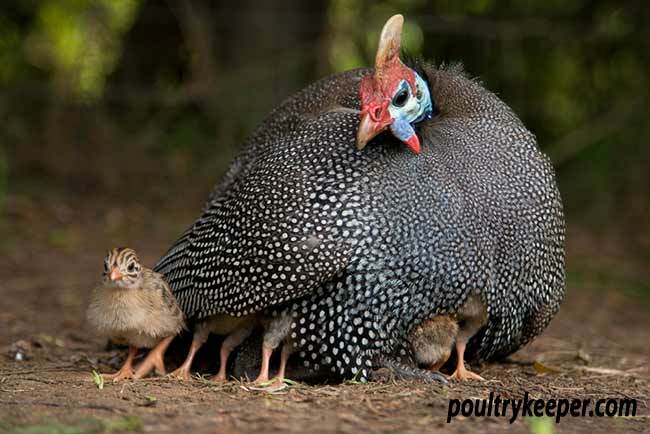 Guinea hens generally don’t make very good mothers although a turkey hen is a good substitute mum if available, as turkeys tend to stay with their youngsters longer than chickens do. Ideally they should be fed a turkey or game bird starter for the higher protein content, but they can also be reared on chick crumbs. Their legs are particularly delicate (this applies to the adults as well) so provide a non-slip surface to help prevent splaying. Keets are lively and agile, so make sure their pen is escape proof and cover it with mesh to stop them jumping out. It’s impossible to tell males and females apart until they start calling at around nine weeks. The females make the classic two-tone sound (‘go-back, go-back, go-back’) which has been likened by some to a saw cutting metal, while the males just have one shrill note. The females can also call on one note though, so listen carefully before deciding which is which. Adult males are usually larger with bigger wattles and head furnishings. Depending on the weather, the keets can be moved to their outdoor quarters when fully-feathered (about six to eight weeks) and fed on growers’ pellets. Keeping them confined to their house for a few weeks will help encourage them to come home to roost when given a wider range. Leave a feeder in their house, and persuade them further with a treat of corn at suppertime. Even so, you may need to dedicate some time to guinea training in the early days. There is an interesting article at Guineafowl International http://guineafowl.international/articles/training.php showing guinea-fowl being herded with two long canes. I’ve never tried this, but if you start when they are young enough it should be feasible. Free-range guinea fowl will find much of their own food, although a supply of feed gives them a good reason to return to their house. They need extra food in winter, and fresh greens will be appreciated too. They can be fed the same rations as chickens or turkeys, and particularly enjoy corn. A container of fresh water is their only other requirement. 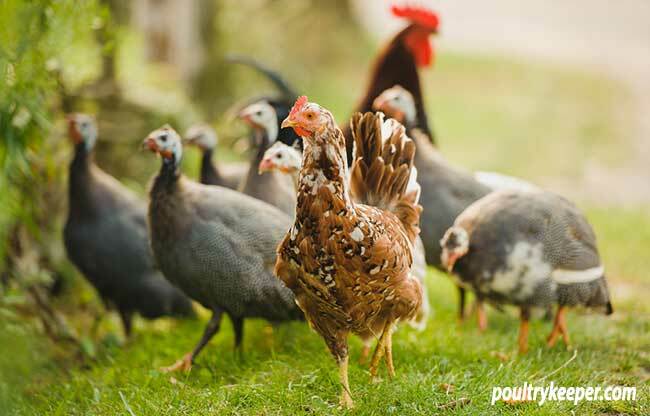 Adult birds are generally hardy and seem to avoid many of the health problems that beset chickens, although they are liable to the same attacks by internal and external parasites. The only time to catch guinea fowl successfully is when they have retired to their house for the night. Use as little light as possible. Never grab a leg, but swiftly bring your hands over the body and wings. Guinea fowl are close-feathered and thus more slippery, so you’ll need to hold on firmly! If you watch the guineas carefully, you may be able to spot where the females are nesting. A male often stands guard, and guinea fowl will share their nests. As with chickens, they usually lay a clutch of eggs and then go broody, but if eggs are collected regularly the birds will keep on laying. 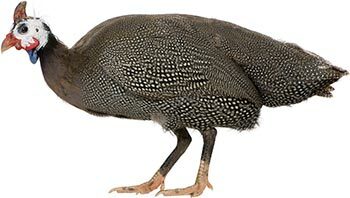 However, make sure there are no guineas around when you take the eggs and leave a few pot eggs in their place, or the guinea fowl will quickly find a new (and probably even more inaccessible spot) to nest. 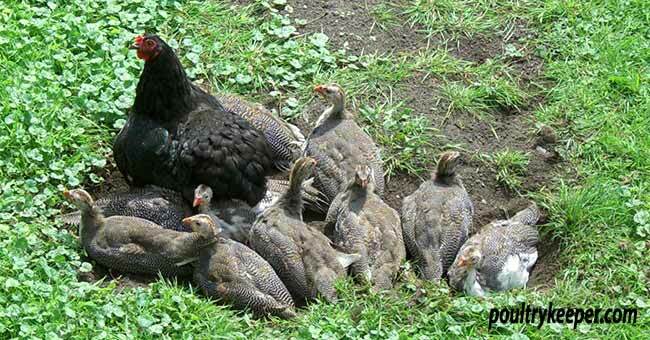 Guinea fowl can be bullies with other poultry and won’t easily tolerate newcomers. They seem to particularly pick on cockerels too. They can be relentless in their pursuit of a victim, and may keep him or her away from the food. That at least has been my experience, and I’ve heard similar stories from other people, but a friend who keeps both chickens and guineas on her farm has had no problems. This is probably down to the extra space, plus her chickens live in a large area surrounded by electric netting. The guinea fowl might drop in at tea-time to have some corn, and sometimes shelter in the hen-house if the weather is bad, but they otherwise tend to keep themselves to themselves. Some people keep guinea fowl and chickens in the same house, but unless they have been very well integrated, it’s probably better to give the guineas their own quarters. 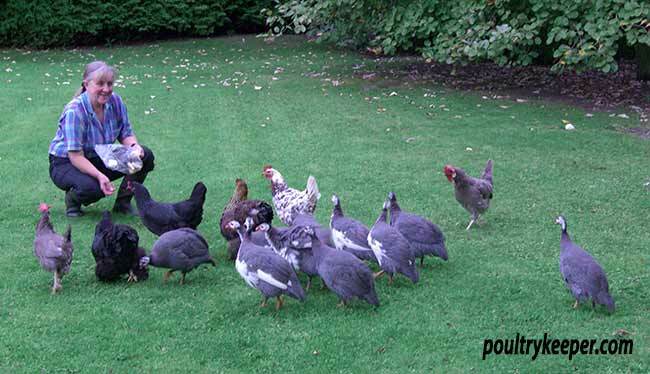 A large garden could be home to a few guinea fowl, although they are likely stray further afield. They range much further than chickens – we have a large garden plus an adjoining field, but that didn’t stop my guineas from crossing the main road (in a single line) and marauding around the neighbourhood. They can fly well when they want to (although like chickens they generally run or walk) so they can cover a lot of ground when feel the urge to explore. While they don’t scratch for food as much as chickens do, they still make dust baths – ten guinea fowl can make a considerable hole in the lawn. Although they will probably eat some vegetation, the ideal guinea fowl diet mostly comprises insects (especially ticks) and seed heads. In fact some growers keep them as an organic form of pest control. If your property is isolated (ideal for guinea fowl), then the guineas will give you and anyone else in the vicinity plenty of warning if strangers approach. They will also sound the alarm if predators are around, and have even been known to gang up on animals, driving them back by drawing unwelcome attention to their presence. I saw this once many years ago, when a bunch of guineas surrounded our whippet. She looked completely baffled for a few minutes, before running into the middle of the gang and scattering them. Although not likely to be a major issue in the UK, guinea fowl hate snakes – they will surround and kill them. Noisy, charming, disruptive, fascinating? 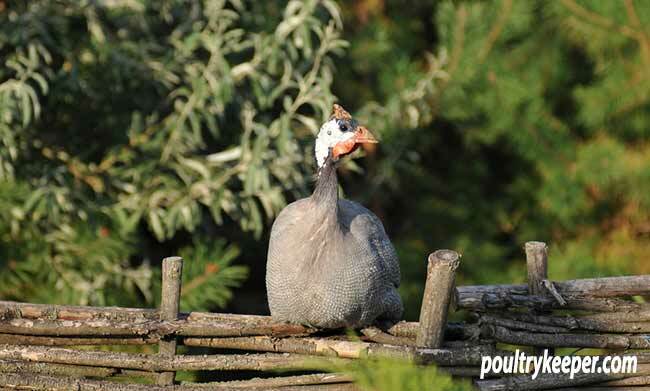 Guinea fowl have their fans and detractors, but one point cannot be overlooked – life with guineas is never boring! Anne Perdeaux is a freelance writer and author of A Family Guide to Keeping Chickens. Living in rural Wiltshire, her love of the countryside and animals inspires much of her writing.